Choosing how to name your baby is not a simple task in any circumstances – you need to consider the possibly different tastes of you and your partner, you might decide to involve your families and seek their opinions as well, or you might want to look at such additional aspects as the popularity of certain names to make sure that by the time your kid goes to school they don’t end up having the same name as three other children in their class. Doesn’t sound easy, does it? Well, in our case there are some additional considerations that kick up the difficulty level of this particular task and they’re related to language. Before I continue I should probably explain that I’m Latvian and my husband is German – Malaysian Chinese. We live in Germany and our child will have two citizenships and two passports – a German and a Latvian one. So, first of all, the name we choose has to work equally well in both languages and the particularities of the Latvian language laws makes this task a little tricky. For example, in Latvian all female names have to end with an A or an E, and all male names end with an S (there are exceptions but these are few and far between). In addition, the Latvian alphabet doesn’t have the letters Q, X, W, and Y but makes up for this shortage by having 11 other letters – long forms of vowels like Ā or Ē, soft forms of consonants like Ļ or Ķ, and consonants like Š that replace “Sh”. 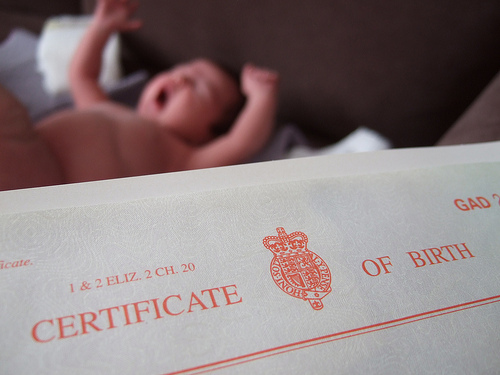 The German language has comparatively less uncommon traits, but the German state has distinct regulations on what names can be given to children and, in cases of doubt, you might need to acquire a certificate stating that the name you’ve chosen is legit. As I have no liking for easy tasks, I have introduced another condition to the mix – I want our kid to have a Latvian name day. A lot of countries have name days, mostly based on church calendars, but what makes the Latvian case somewhat special is that there is a set calendar listing several names each day and a name day celebration is equal in size to a birthday celebration. In fact, you may end up having much more well-wishers, flowers, and gifts because everyone knows it’s your name day as soon as they look in the calendar. In short, name days are a wonderful tradition and one I would like our child to be a part of. To make this whole affair even more fun, my father-in-law insists on following their family tradition and giving the child a Chinese middle name. The way this works, is that Chinese names have two characters one of which – the “spreading character” – is the same for all males or females in a generation while the other character is individual (click here for a good description of how this works). Of course, the Chinese characters need to be adapted to the Latin alphabet and the writing of that single character varies depending on that whether you follow the Mandarin or the Cantonese pronunciation. While these conditions are relatively easily adapted in German, the peculiarities of the Latvian language make it incredibly difficult to find a name that fits without needing to be written quite differently. What can I say: wish us luck! Hi, found your blog through Dziesma at Latvian-American Adventures and Opinions. I’m an American-Latvian with two boys (a third on the way), and we’ve just returned from two years abroad in France. Looking forward to more posts concerning multi-culturalism and bilingualism, as we speak Latvian at home – but know it will be a struggle once the boys are older. Hi Liene, thank you for following! How are you doing so far with raising your boys bilingually? I totally understand the complication! My husband is Tibetan and they have 2 names given by a holy person – both are treated like first names and they rarely use a family name. I am Italian-Australian and would like our child to have a ‘European’ middle name. And then my husband and I don’t have a matching family name…. I’m trying to make all the names work and not give any opportunity for teasing in school. It’s a very difficult task!! Hi! I just discovered your blog and have subscribed! Great post! My Spanish husband and I faced the same situation: deciding on a girl’s name that can be pronounced in both Spanish and English. There are so many names in English I like, but that don’t sound beautiful in Spanish; on the other hand, as I’m not a native Spanish speaker, nor did I grow up in Spain, I don’t always understand the implications/connotations/associations of certain names in Spanish. My husband will say, “Oh, no, not that name; that’s a name for an 80 year old man.” Haha!! Thank you, I have to check out your blog as well! By the way, I completely understand your problem 🙂 Crazy thing is, girl names are actually easy compared to boy’s names, wouldn’t you agree?